Surprise! Another kale salad recipe! Is kale still having its moment, or am I living in 2007? And if I am, I hope I’m dressing better. If nothing else, this salad is well dressed. This tahini Caesar dressing has all the flavors you would expect from a traditional Caesar- creamy, garlicky, lemony- but has a subtle nutty kick from the tahini. I love using kale instead of Romaine because it holds up wonderfully to the dressing, and well, because it has’t been classified as a health hazard by the CDC. Massaging a few tablespoons of the dressing into the leaves helps to break down the fibers, tenderizing the greens, making them easier on your palette if you find raw kale hard to eat. Throw in some confit chickpeas, sumac roasted squash, and BOOM! 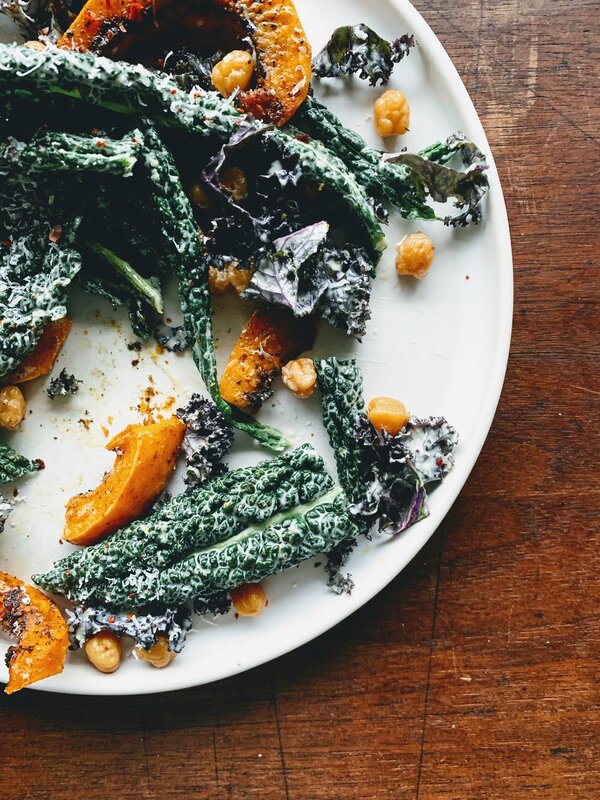 A kale Caesar salad that you’ll find yourself craving to eat most days of the week. I’ve included two versions of the salad dressing- one standard, and one that is Whole30 approved. If you’re doing a Whole30 like I am right now, omit the chickpeas and add in some grilled chicken or soft boiled eggs. But if you’re not on some crazy restrictive diet, I highly recommend taking the time to confit the chickpeas. Soak dried chickpeas in water overnight. Drain, then add chickpeas, olive oil, garlic, thyme, and salt to a medium sized sauce pan. Bring oil to a simmer on medium-medium low heat. Simmer chickpeas for 45 minutes or until tender but not mushy. They should be golden color on the outside. Drain chickpeas and garlic and reserve oil in a heatproof container. Discard the thyme. Preheat oven to 400 degrees. On a large roasting pan, drizzle squash with olive oil and season with salt, pepper, and sumac. Use your hands to rub the oil and spices on the squash, making sure each piece is evenly coated. Cook for 15 minutes, or until squash is fork tender. Combine all ingredients for tahini Caesar dressing into a large jar, and shake until everything is combined. Tear kale into large pieces and massage 2-3 tablespoons of dressing into the leaves. Top with roasted squash, a few tablespoons of chickpeas, and a good sprinkling of Parmesan cheese. Season to taste with Aleppo pepper flakes.